LEAD JUDGMENT: TIJJANI ABUBAKAR, J.C.A. This appeal is against the Ruling of the Federal High Court, Lagos Division, delivered by Shagari J. on the 16th day of January 2018 in suit No. FHC/L/CS/625/2017 wherein the learned trial Judge refused and struck out the Appellants’ Application dated 23rd June, 2017. The said Application was filed by the Appellants seeking to set aside the Ex Parte Order made by the Federal High Court on the 11th day of May, 2017 recognizing and enforcing the Final Award of the 14th day of February, 2017. The Federal High Court refused the Appellants’ Application on the ground that it was functus officio. Aggrieved by the decision, the Appellant appealed to the Court of Appeal. Whether in the circumstance, the Federal High Court, Lagos Division (Coram: Hon. Justice Hadiza R. Shagari) should have granted the Appellants’ Motion dated the 23rd of June 2017 as prayed and inter alia discharged, vacated and set aside the Ex-parte Order made by the learned trial judge on the 11th of May, 2017 and the Certificate of judgment dated the 30th of May, 2017 issued pursuant thereto. Was the learned trial Judge wrong in law when she held “Motion on Notice of the Respondent did not succeed”? On the whole, the Court of Appeal found merit in the appeal and accordingly allowed same. The Ruling of the Federal High Court granting leave to the Respondent to enforce the Arbitral Award was declared a nullity and was accordingly set aside. The matter was remitted to the Hon chief Judge of the Federal High Court for reassignment to another Judge, to be heard and determined. The Court ordered that the Appellants as Respondents at the Federal High Court be served the Originating Summons and all other processes. “The Originating ex parte is the genesis of the journey leading to the controversy in this appeal. Appellants argued that considering the nature of the relief(s) sought by the Respondent, that is, to enforce the London Arbitral Award against the Appellants, they ought to have been put on notice so as to ensure that the Appellants were given fair hearing as enshrined in the 1999 Constitution given the magnitude of the Award. On the other hand, the Respondent vehemently contended that Order 52 Rule 16(1) of the Federal High Court Rules regulates the manner in which an application for the enforcement of an award should be made, and prescribed that it can be made ex parte as done in the instant case. Now, Section 31 of the Arbitration and Conciliation Act, provides: (1) An arbitral award shall be recognized as binding, and subject to this section and Section 32 of this Act, shall, upon application in writing to the Court, be enforced by the Court. (2) … (3) An award may, by leave of the Court or a judge, be enforced in the same manner as a judgment or order to the same effect. Whereas, Order 52 Rule 16 (1) of the Federal High Court Rules, states that: “An application to enforce an award on an arbitration agreement in the same manner as a judgment or order may be made ex parte, but the Court hearing the application may order it to be made on notice.” Learned Counsel for the respective parties have referred this Court to the decision in IMANI & SONS LTD Vs. BILL CONSTRUCTION CO. LTD (Supra) where OGUNTADE, JCA (as he then was), while considering the provisions of Section 31 of the Arbitration and Conciliation Act, pronounced as follows: “The Lower Court reasoned that the purpose of an application brought pursuant to Section 37 of the ABCA Cap. 19 was merely to inform respondent on the application and that it was not meant that such respondent should file a counter-affidavit. By that reasoning the Lower Court was also saying that a respondent put on notice was not expected to even address the Court even on point of law. That the Lower Court understood Section 31 of ABCA Cap. 199 was manifest in what it proceeded to do immediately it refused adjournment sought. Without asking the appellants’ counsel what he intended to do following the refusal by the Lower Court of the application for adjournment, it proceeded to make the order sought on the Originating Summons. A perusal of Section 37 of the ABCA shows that it is not prescribed thereunder that a respondent to an application shall be put on notice but it seems to me that since the procedure is one leading to the granting of an order which may affect another’s proprietary interest, I must read into it a provision to the effect that a party against whom an order under Section 37 ABCA is sought must be put on notice….” Expressing similar opinions, ADEREMI, JCA (later JSC) (of blessed memory) observed as follows: “… To have construed Section 37 of the Arbitration and Conciliation Act Cap. 19 Laws of the Federation 1990 as carrying a legal force which denies a party who would be affected by the eventual order or judgment of a Court hearing before such order is made is a negation of fair hearing enshrined in our Constitution. And such law must not be accorded any application for it defeats the course of justice and erodes into the confidence which all law abiding citizens must have in the administration of justice – an essential to social order and security…” The above decision proceeded on appeal to the Supreme Court in BILL CONSTRUCTION CO. LTD Vs. IMANI & SONS LTD  19 NWLR (Pt.1031) 1, and while the Supreme Court found and held that the Court of Appeal was in error in its decision that the Respondent therein was not granted fair hearing, there was no pronouncement by the Supreme Court relating to the position of the law stated by this Court that a person to be affected by an application brought pursuant Section 31 of the ACA must be put on notice. In the words of TABAI, JSC, at page 17 of the law report; “The learned trial Judge, rightly in my view, refused that request for an adjournment in that such a counter-affidavit could not be taken as an application to set aside the arbitral award as provided for in Section 29(1)(a) of the Arbitration and Conciliation Act which has to be made within three months of the delivery of the award. The Lower Court, however allowed the appeal and set aside the order made by the trial High Court. I believe that the Lower Court was in error in its decision in the matter because the counter-affidavit sought to be filed by the respondent could not serve any useful purpose. This is because, any request made in such application to set aside the arbitral award could not be entertained by the Court as it would not have been made within the three months stipulated by law for making such application…” Contrary to the erroneous contention of the learned Counsel for the Respondent, the decision of the Supreme Court setting aside that of this Court was hinged on the fact that the Counter-Affidavit sought to be filed by the Respondent therein will serve no useful purpose as the time prescribed for the setting aside of the arbitral award had elapsed. It is also striking that in that case the Respondent therein was indeed put on notice of the motion seeking leave to enforce the Arbitral; but rather than file a counter affidavit, it filed a preliminary objection (filed after three months of the delivery of the award) which was subsequently over-ruled by the trial Court; whereupon the Respondent sought an adjournment to file a counter-affidavit in respect of the motion to enforce. This was not granted by the trial judge for the obvious reason enumerated by the Supreme Court. Therefore, I am unable to accept the Respondent’s contention that the pronouncement of this Court in IMANI & SONS LTD Vs. BILL CONSTRUCTION (Supra) with respect to the construction of Section 31 of the ACA was overruled by the Supreme Court on appeal. As I indicated above, there is nothing to that effect; as a matter of fact, I adopt the reasoning that it must be read into the provision of Section 31 of the ACA that any application for the recognition and enforcement of Arbitral award, which touches on the proprietary or pecuniary interest of another, must be served on that person. For the avoidance of doubt, the reasoning of this Court in the above case remains much more potent where, as in the instant case, the Respondent seeks leave to enforce an arbitral award within three months of the delivery of the said award. Looking at the decision of the Supreme Court in BILL CONSTRUCTION (Supra), it is obvious that the Court was persuaded to reach its conclusion primarily on the ground that the three months prescribed for the filing of application to set aside an arbitral award under Section 29 of the ACA had elapsed. That is not the situation in this case. Order 52 Rule 1-6 (1) of the Rules of the Lower Court may have given the learned trial judge the discretion to direct that application filed ex parte for the recognition and enforcement of an arbitral award, be made on notice, I believe the discretion will be shown to have been exercised judicially and judiciously, not warranting interference by this Court, the learned trial judge should have exercised restraint and ordered that the Appellants be put on notice before any order is made against them, considering the peculiar circumstances of this case, and in particular Section 29 of the ACA which reads: “(1) A party who is aggrieved by an arbitral award may within three months – (q) from the date of the award; or (b) in a case falling within Section 28 of this Act, from the date the request for additional award is disposed of by the arbitral tribunal, by way of application for setting aside, request the Court to set aside the award in accordance with Subsection (2) of this section.” Sections 29(1) and 31(1) of the ACA as well as Order 52 Rule 16 (1) of the Federal High Court Rules, seem to me, plain to the effect that, an application for the recognition and enforcement of arbitral award may be made either ex parte or on notice; where it is made ex parte, the Court may direct as it deems fit that the other party be put on notice. It is my view, that where the Application is made within the three months the Award is made, the debtor is permitted to apply to set aside the award, such application must be made on notice or the Court should direct that the other party should be put on notice. On the contrary, where the three months prescribed had elapsed, it implies that the Award debtor does not intend to exercise his right under Section 29 of the Act; and the shoreline is then clear for the Applicant to make his application ex parte without the fear that the statutory right of the Award debtor is being supplanted. In AYOADE Vs. SPRING BANK PLC  4 NWLR (Pt.1396] 93, the Court held that: “One of the cardinal requirement of law, to imbue a Court with jurisdiction to hear a case, is that, the person to be affected by its decision must be duly summoned or served with processes of Court and given opportunities to be heard or defend themselves. That is an inalienable constitutional right of every person. A Court has no jurisdiction to make orders to bind a party that was not given opportunity to be heard by the Court before issuing the order, except such persons are agents, servants, or privies of the parties to the case, in which case they are contemplated…” Therefore, having contemplated making the Appellants at the receiving end of the Originating Application filed by the Respondent to enforce the Arbitral Award within three months of its delivery, and as it is aimed at affecting them, the Court ought to have directed that the Appellants be put on notice, to give them opportunity to be heard before visiting on them the calamity of abrogating their statutory right under Section 29 of the ACA, to have the award set aside within three months of delivery. 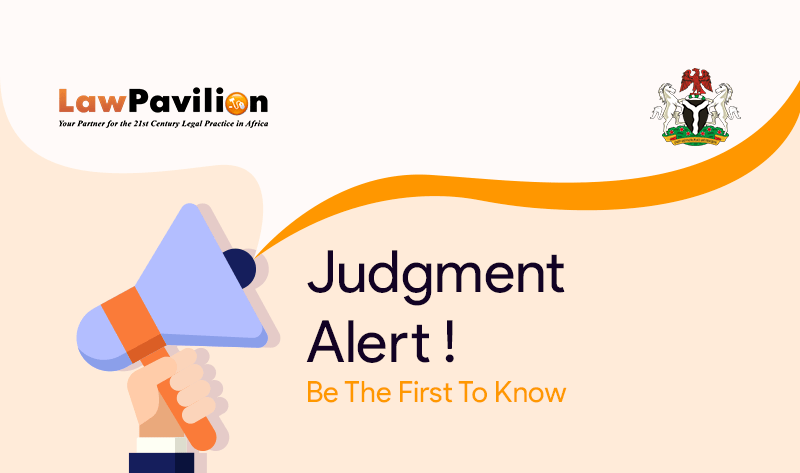 The learned trial judge adopted the decision of this Court relied upon by the Respondent in UMAR Vs. ONWUDINE (Supra); but as will be seen, both the Respondent and the Lower Court misconceived the reasoning of the Court in that case. If the learned trial judge had carefully studied the decision of this Court in that case, it would have reached a different conclusion. At page 149 to 152 of the Report, this Court, per UMOREN, JCA, while considering the question I earlier raised, as to whether an application should be heard and granted ex parte, held as follows: “…I have examined the nature of the orders made by the learned trial Judge. I am of the view that it entails deliberation on a number of well-settled issues upon which the right of the applicant to the grant of it depends… Clearly, whenever the need arises for the determination of the civil rights and obligation of every Nigerian, this provision (Section 33 of the 1979 Constitution, now Section 36 of the 1999 Constitution) guarantees to such a person a fair hearing within a reasonable time. Fair hearing has been interpreted by the Courts to be synonymous with fair trial and as implying that every reasonable and fair minded observer who watched the proceedings should be able to come to the conclusion that the Court or other tribunal has been fair to all the parties concerned… As this is so, an order which ex-facie, as in this appeal, looks final, lacks at least one of the attributes of fair hearing or as for example, equality of opportunity to both sides to the contest… Once a party or an appellant as in this case shows that there is an infringement on the principle of natural justice against him, it is my view that he need to show nothing more. The finding that there is an infringement of the principle is sufficient to grant him a remedy….” Without any particle of doubt, there is nothing in the entire decision of this Court in UMAR Vs. ONWUDINE (Supra) supporting the conclusion reached by the Lower Court and the stance taken by the Respondent. To the contrary, this Court clearly held that any provision of rules of Court or Act which states that an Appellant cannot appeal against an ex parte order which is ex facie a final order or decision is inconsistent, null and void with the Constitution. Also, according to OMAGE, JCA at page 156 of the Report, a party against whom an ex parte order is made has the option of approaching the Court to have same vacated or elect to appeal, as done in that case.